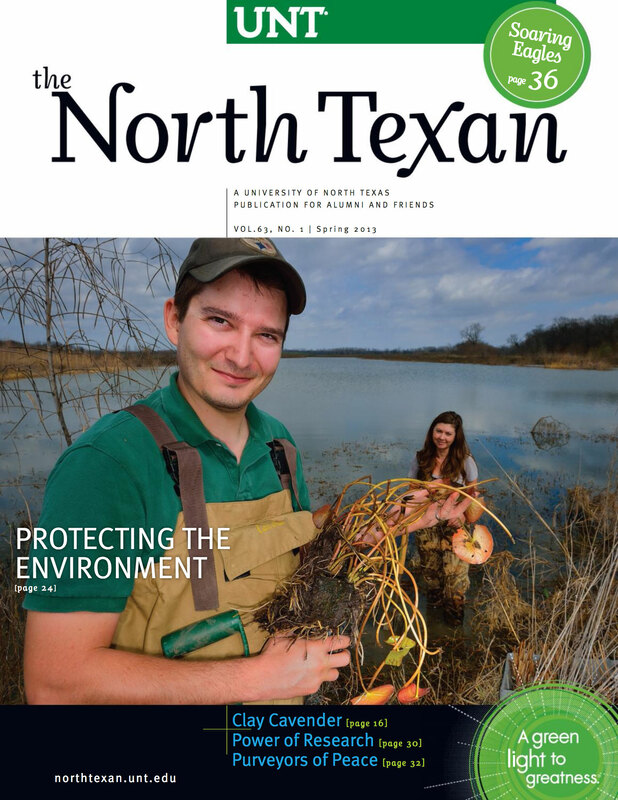 Forward-thinking alumni help preserve waterways, air quality, and plant and animal life through sustainable and renewable solutions. Merchandising alum helped grow Cavender's Boot City into a multi-state retail chain. Extended questions and answers from alum Clay Cavender ('91). UNT gives students knowledge and skills to build careers. UNT has a starring role in the new Eli Young Band webisode Life at Best. Ruth Ann Davison Torgerson ('50) shares why she treasures a Fannie Farmer cookbook. 2013 Alumni Award winners include current and legendary chart toppers. Emphasizing high quality in every area, UNT continues to advance students, research and creativity. UNT alumni are leading peace studies research to create real solutions for world conflicts. Through real-world interactions and skills-building, UNT is preparing students for the marketplace. I was a little confused about a comment made in the short article about a new Union. Assistant professor of English's book discusses Victorian novels and Hollywood films. As a marketing student, Tiffaney Dale Hunter ('01) dreamed of being a marketing consultant. One of my favorite places on campus was the gazebo. Alumna organizes women's and girls' programs and malaria prevention in Ethiopia. To better serve more than 1,000 alumni in Thailand, UNT opened an office in Bangkok. Watch a video of students and Scrappy gathering for a recent flash mob at Apogee Stadium. In August, the Student Alumni Association was launched. Matt ('07) and I met on campus the first year Victory Hall opened. Ben Barry's ('07) inspiration helps feed Facebook's company culture. The world premiere of Jake Heggie's Ahab Symphony will be performed on campus. Associate professor of history shows relationship between eating habits and identities. Former members of the North Texas track and cross country team gathered for a reunion in 2011. On Future Game Changers, SI.com profiles Mean Green basketball forward Tony Mitchell. For C. Dean Davis ('53), former chair of the UNT Board of Regents, attending UNT is a family affair. How can couples keep love in the air? Watch alumna Norah Jones perform Everybody Needs a Best Friend. New media art assistant professor combines robotic art with ancestral techniques. Dance alumni will return to UNT April 25-28 as part of "Celebrating the Power of Dance." The Mean Green basketball teams will join Conference USA this summer. UNT alumni struck gold in the entertainment world's awards ceremonies in February. As a photojournalist during the Iraq War, Thorne Anderson saw a different side of the conflict.